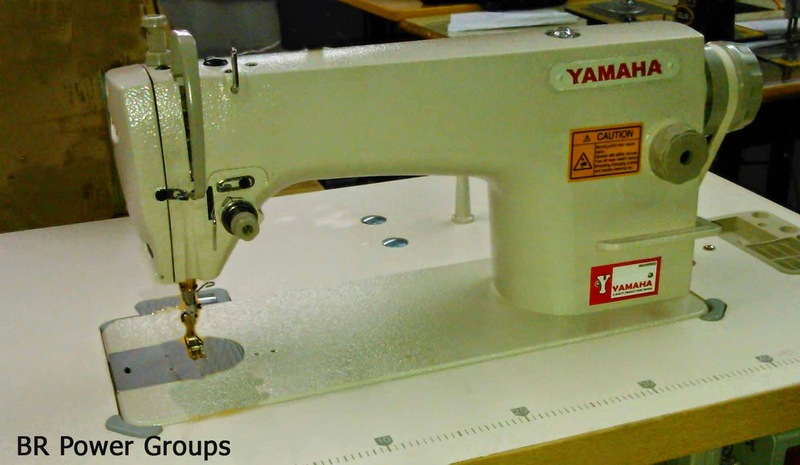 The superior quality Yamaha power, single needle lockstitch sewing machine has been more improved now to last for decades. The lockstitch uses two threads, an upper and a lower. Lockstitch is so named because the two threads, upper and lower, "lock" (entwine) together in the hole in the fabric which they pass through. The upper thread runs from a spool kept on a spindle on top of or next to the machine, through a tension mechanism, through the take-up arm, and finally through the hole in the needle. Meanwhile the lower thread is wound onto a bobbin, which is inserted into a case in the lower section of the machine below the material. To make one stitch, the machine lowers the threaded needle through the cloth into the bobbin area, where a rotating hook (or other hooking mechanism) catches the upper thread at the point just after it goes through the needle. The hook mechanism carries the upper thread entirely around the bobbin case, so that it has made one wrap of the bobbin thread. Then the take-up arm pulls the excess upper thread (from the bobbin area) back to the top, forming the lockstitch. Then the feed dogs pull the material along one stitch length, and the cycle repeats. Ideally, the lockstitch is formed in the center of the thickness of the material—that is to say: ideally the upper thread entwines the lower thread in the middle of the material. The thread tension mechanisms, one for the upper thread and one for the lower thread, prevent either thread from pulling the entwine point from out of the middle of the material. Of a typical garment factory's sewing machines, half might be lockstitch machines and the other half divided between overlock machines, chain stitch machines, and various other specialized machines. Industrial lockstitch machines with two needles, each forming an independent lockstitch with their own bobbin, are also very common. There are different types of lockstitch industrial machines. The most commonly used are the drop feed for light and medium duty, and walking foot for medium and heavy duty like the Class 7 with an impressive 3/4" foot lift. This makes the Class 7 able to stitch through heavy materials up to 3/4" with threads as strong as 57 lbs. Originally made by Singer in the US and Europe for supplying the demand of heavy duty clothing for the troops, for many years after the war this class was not available as new because the market was filled. With the outsourcing of many sewing manufacturing jobs, nowadays many Chinese Class 7 machines are available and built by Federal Specifications giving them equal performance to the original ones (FSN:3530-3111-1556, FSN: 3530-3111-3675, FSN: 3530-311-1556, FSN: 3530-3111-3075). Most industrial lockstitch machines sew only a straight line of stitches. Industrial zig-zag machines are available, but uncommon, and there are essentially no fancy-pattern stitching industrial machines other than dedicated embroidery and edge decoration machines. Even something as simple as a bar-tack or a buttonhole stitch is usually done by a dedicated machine incapable of doing anything else. When a variety of decorative stitching is required rather than a single stitch, a "commercial" machine (basically a heavy duty household machine) is usually employed.